I was inspired by a side dish at DeSoto’s, a very good neighbourhood restaurant. 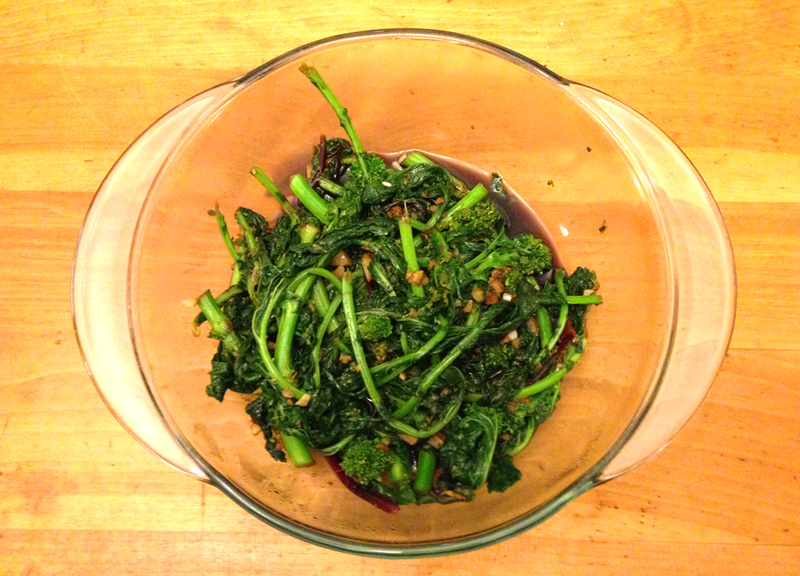 I love rapini and this is quick and very, very tasty. In a small saucepan, heat the balsamic vinegar and wine uncovered until it becomes syrupy. If it becomes TOO thick, add water to thin. Heat 1 tbsp olive oil over medium heat in a large sauté pan that has a lid. Add rapini and salt. Toss with kitchen tongs to coat every piece in oil and garlic. There was a ton of rapini so I did this in stages, the rapini will wilt and reduce in size as it cooks. Add a splash of water to the pan and cover for about 5 minutes or longer, depending on how al dente you like your veggies. Once the rapini is cooked to your liking and the balsamic reduction is ready, toss it all together with the second tablespoon of olive oil. That’s it! It’s a super tasty way to get your greens in!